What to Do With the Kids Back in School — With fewer playmates around, is your pet napping the day away on the couch? Consider hiring a dog walker to take your pooch on a stroll around the neighborhood during the day. Schedule a game of laser chase with your cat over your lunch hour. Or consider dropping your dog at day care so he or she can romp, socialize and burn off energy while you’re at work. Walking in the Dark — As the days get shorter, you may find that your usual morning or evening walk takes place in the dark. Consider buying a reflective leash, collar or coat to make sure your pet is visible to nearby cars and cyclists. Tick Checks — Just because the leaves are falling doesn’t mean the ticks are hibernating. Help keep your pet protected with regular tick prevention and thorough tick checks when they come indoors. Allergies — People who suffer from hay fever and ragweed allergies can be miserable until the first frost. The same goes for pets who have environmental allergies. If your pet is itching, scratching or chewing on his or her skin, consult your veterinarian for medications that can help bring your pet relief. Fur Coat Care — Many pets shed more in the fall as their winter coat comes in. Take the time to brush your pet regularly, so there will be less to clog your vacuum cleaner. Bundle Up — As the mercury drops, dogs and cats who have thin coats or are hairless can start to shiver. To keep them toasty, stock up on pet sweaters or booties before the first snowflake appears. Human Cold and Flu Medications — In this season of sniffles and sneezes, remember that your over-the-counter drugs may contain potentially dangerous ingredients for pets. Acetaminophen can be problematic to dogs but especially toxic to cats, where it can lead to liver failure and poor oxygen delivery to the body. Ibuprofen and naproxen, often combined with decongestants, can cause ulcers or liver and kidney damage. And certain decongestants, in high doses, can cause seizure and death in pets. Why risk it? It’s best to keep all cold and flu meds out of the reach of curious pets. Wild Mushrooms — Although many wild mushrooms aren’t toxic, some common backyard species can be poisonous and even deadly if eaten by dogs and cats. For example, as little as half of a fresh “death cap” mushroom (Amanita phalloides) can be fatal to an adult dog. To see photos of other poisonous mushrooms, check out this slideshow. But since many mushrooms can look alike, it may be simpler to remove them from your yard and keep pets on a leash when hiking in the woods. Other Four-Legged Creatures in Your Home — When there’s a chill in the air, rodents are drawn inside where it’s warm and there’s plenty to nibble in your cupboard. Make sure to place rodenticides out of your pet’s reach. Depending on the type of poison, they can lead to internal bleeding, kidney failure, seizures and death if eaten by pets. Antifreeze and Windshield Deicers — Are you getting your car ready for winter? Antifreeze and other car products may contain ethylene glycol. Many dogs and cats find its sweet taste inviting, but ingesting a large enough amount can lead to kidney failure. Be sure to clean up any spills on the garage floor and lock all car products away from wandering pets. 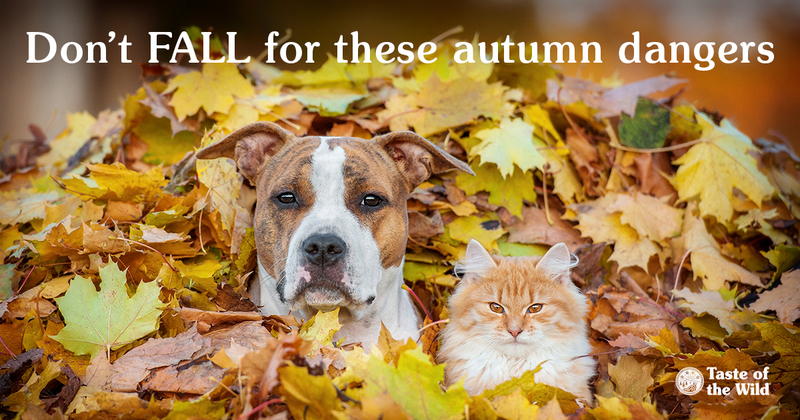 With a little planning, you can help protect your pet from seasonal incidents. And that should make you feel as warm and comfortable as your new flannel shirt.